Joining us as course tutor for Suspensionology and iFormulate4Nano is Professor Ian Scowen. Ian is a solid-state chemist with wide-ranging interests in developing ‘chemistry beyond the molecule’ for formulation science, including pharmaceutical materials engineering, supramolecular chemistry and self-assembled nanostructures, catalysis and pre-biotic chemistry. 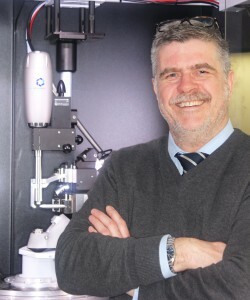 He has wide-ranging experience in the development of novel analytical methods for complex materials [particularly X-ray diffraction and vibrational spectroscopy (Raman and IR)] for pharmaceutical, forensic, astrobiological and process monitoring applications. Ian is the Founding Head of the School of Chemistry at Lincoln. Prior to this, he led of the development of successful Chemistry4 programmes at Bradford, was the founding Director of the Bradford’s University Analytical Centre and was instrumental in developing the commercial strategies for the Bradford’s Institutes of Cancer Therapeutics and Pharmaceutical Innovation. He was also Director of the Pharmaceutical Innovation Centre of industrial Collaboration at Bradford and continues to collaborate widely with industry and has been responsible for over £2.5m commercial research income and has acted as an Expert Witness in pharmaceutical patent proceedings. He has published over 110 peer-reviewed publications and has supervised over 20 postgraduate research students to completion.